Categories: Krishna, Ramanujacharya, Srimad Bhagavatam. 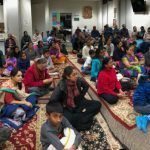 By the immense grace of Sri Swamiji, Detroit GOD Satsang members celebrated Sri Poornimaji’s visit to Detroit with beautiful satsangs from September 15-19 2017. Srimad Bhagavatham Dasma Skantha Parayanam was conducted in the morning and Sri Ramanuja Vaibhavam discourse in the evening on all the days. 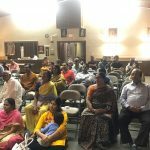 Sri Poornimaji’s five day discourse series on Sri Ramanuja Vainbhavam went very well at Sri Balaji temple in Great Lakes from September 15 – 19 2017. 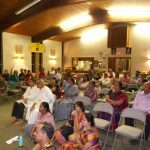 Sri Poornimaji lucidly explained the divine Charitra of the great Acharya Sri Ramanuja acharya and everyone listened with awe and reverence. 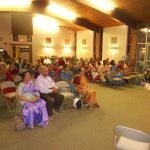 Close to 55 devotees listened to Sri Poornimaji’s divine expositions every day. Day1: September 15 2017- The morning programs began with Prabodhanam, Mahamantra followed by Srimad Bhagavatam Parayanam of Dasama Skandam. Evening program started with MahaMantra and Madhura Geetam songs sung by Smt. 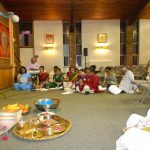 Ambujam Venkatesan Bhajan Group. 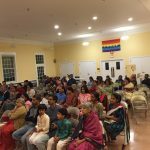 This was followed by Sri Poornimaji’s discourse on Sri Ramanuja Vaibhavam. 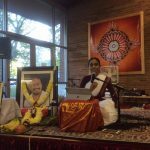 She talked about the importance of Acharya/Guru and about the Sri Vaishnava Sampradaya. She said that Sri Ramanuja acharya was a well-known philosopher, very well explained the lineage of Guru Parampara and that the philosophy was originally started by Lakshmidevi herself, then passed on to Vishvaksenar, then to Namazhwar (Sadagopan), then to Nathamunigal, continued by Uyyakundar following Manakal nambi and finally to Alavandar. 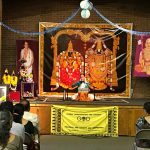 Day2: September 16 2017-The second day of the event started with Mahamantra, prayer and Srimad Bhagavatham Dasma Skantha parayanam in the morning. 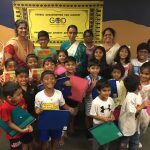 In the afternoon at around 12.30 pm Sri Poornimaji interacted with the Gopa Kuteeram kids and chanted Nama with them and taught them the Dhyana sloka on Sri Swamiji. She gave certificates to students who won the Mahamantra writing contest conducted by GOD US early this year. In the Evening PriyaJi and LathaJi rendered Maduragitams (Compositions of Sri Swamiji). 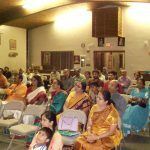 Sri Poornimaji continued the Sri Ramanuja vaibhavam lecture covering birth story of Sri Ramanujacharya, his early studies under Yadava Prakashar. And how Varadaraja Perumal and Perundevi Thayar helped to bring back Sri Ramanujar from Western Ghats to Kanchipuram. Day3: September 17 2017-The Third day of the event started with Mahamantra, prayer and Srimad Bhagavatham Dasma Skantha Paryanam in the morning. 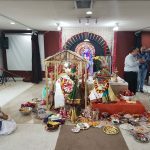 A grand Andal Kalyanam was conducted on Sunday, September 17th 2017 in Bhagavata Dharma tradition and close to 30+ devotees took part in this divine wedding. In the Evening Madura Geetams was rendered by Jayashreji’s bhajan group. That evening, Sri Poornima Ji Discourse continued with Sri Ramanuja’s kainkaryam to “Sri Deva Perumal at Kanchipuram And how Varadharaja Perumal cleared his six questions. 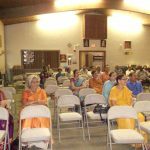 She also talked about Sri Ramanuja’s three vows to “Sri Yamunacharya. Day 4: September 18 2017-The Fourth day of the event started with Mahamantra ,prayer and Srimad Bhagavatham Dasama Skantha Paryanam in the morning. In the Evening Madura Geetam vocal was rendered by Moham ji, Indu Jaganathanji, Malini Rangaswamyji, Abhinaya Ji and Jayshreeji. In the evening, Sri Poornimaji’s discourse continued with Sri Ramanuja Acharya’s Pancha Samskaram by MahaPurna Periya Nambi at Maduranthakam and his education of Rahasyathrayam from Periya Nambi. Also she continued about Sri.Ramanujar’s Sanyasam given by the Lord Varadharajar himself and about Varadharajar naming his “Yathirajar”. 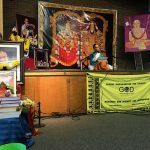 She explained about Sri Ramanujar’s learning Ramayanam from Thirumalai Nambi and his learning experience from Thirukoshtiyoor Nambigal. Day 5: September 19 2017- The Fifth day of the event started with Mahamantra, prayer and Srimad Bhagavatham Dasma Skantha Parayanam in the morning. In the Evening Madura Geetam bajans was rendered by Venkatesa Kesavan Group, supported by Sri Surenderji on keyboard. 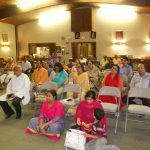 After the bhajans Poornima ji continued her fifth day lecture. She talked about Kurthalwr, Mudhaliandan, Anathalwan, Kidambi Aachan, ThirukurugaiPiran Pillan and Nadadhur Azhwan who were the devotees of Sri Ramanujacharya. 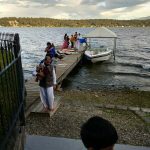 She then talked about Various works of Sri Ramanuja such as Vedārthasangraha, Sri Bhashya (a review and commentary on the Brahma Sutras), Bhagavad Gita Bhāshya and the other works titled Vedantapida, Vedantasara, Gadya Trayam (three texts called the Saranagathi Gadyam, Sriranga Gadyam and the Srivaikunta Gadyam), and Nitya Grantham. Sri Poornima ji concluded with Mass Maha Mantra Prayer.